Chilika Lake is the largest wetland along the east coast of India. The lake is a unique assemblage of marine, brackish and fresh water eco-systems with estuarine characters. This fragile ecosystem is known for its amazing biodiversity and is a designated Ramsar site. It is an avian grandeur and the wintering ground for more than one million migratory birds. The highly productive lake eco-system with its rich fishery resources sustains the livelihood of more than 200,000 fisher-folk who live in and around the lake. The long shore sediment transport along the coast of Bay of Bengal estimated to be 0.1 million metric tonnes annually tend to shift the lake mouth opening to the sea every year. The spatial and temporal salinity gradients resulting from the freshwater flow from the drainage basin and the seawater influx, give it the unique characteristics of an estuarine eco-system, exercising a continuous and selective influence on its biota. The open use of the common property resources, illegal shrimp culture and the hydrological alterations by way of man-made construction upstream resulted in change in its ecological characters and it was added to the list the Montreux Record (threatened list of Ramsar sites) in 1993. 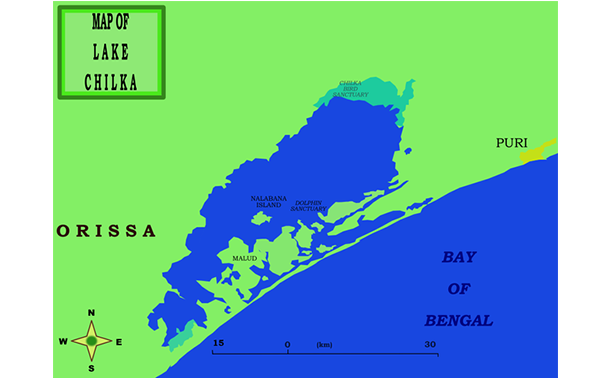 The principle adopted for restoration and management of Chilika Lake by the Chilika Development Authority (CDA) has been largely based on the Ramsar guidelines, which recommend a diagnostic approach based on a critical evaluation of ecological, economic and socio-cultural features to identify objectives and operational limits including factors for restoration and effective management of wetland ecosystems. Based on the hydrodynamics modeling and wide consultation CDA carried out a hydrological intervention by way of opening of an inlet in 2000. Considering the sensitive ecosystem of the lake, for tracking the lake ecosystem, sensors mounted on buoys have been deployed at 10 strategic locations of the lake that transmit the water quality data on real-time basis to the CDA laboratory. As a result, several positive changes are being observed: the lake fisheries have revived significantly from 1,747 MT in 2000 to 14,228 MT in 2012, 6 species of fish reappeared following the restoration of the salinity gradient, an increase in tidal flux, expansion of sea grass meadows and species diversity and an expansion of the habitat of the critically threatened Irrawaddy dolphin. The amelioration of the biodiversity created community-based eco-tourism. 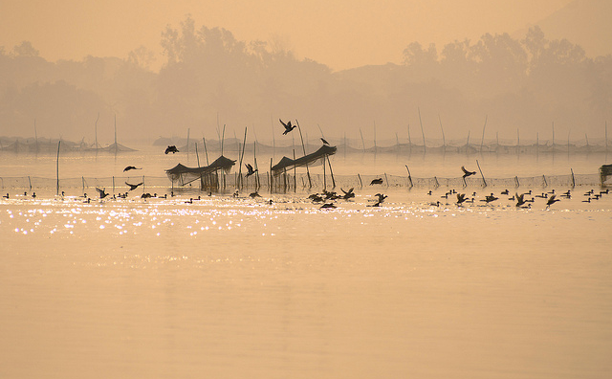 The Mangalajodi marshes of northern Chilika offer a true example of ecotourism, here, reformed bird hunters guide small groups of tourists quietly through a watery wonderland. Due to successful restoration, Chilika was removed from the Montreux record by the Ramsar bureau with effect from 11th November 2003. Chilika Lake is the first wetland from Asia to be removed from Montreux record. The restoration of Chilika demonstrates how restoring ecological character of a wetland can result not only in amelioration of biodiversity, but can sustain the livelihood of local communities due to increase in productivity and ecosystem services. Fortunately, many communities have now begun to realise the need for responsible and wise use of resources. Chilika cannot be seen merely as a source of livelihood for humans. Its biological diversity is a priceless heritage that must be preserved. If managed with care, this vibrant lake can provide an enduring future, both for its people and its life forms.